Nehal is enjoying his Dasara break with his friends. School break means more work for me in the kitchen. I don’t mind it at all, in fact, enjoy it. 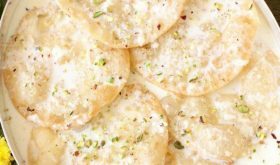 🙂 Yesterday, I baked a charming, delicious sweet treat for Nehal and his friends. Pineapple Upside Down Cake! Though it sounds and looks fancy, its a breeze to make. 1 Preheat oven to 175 C. Grease and flour a round baking pan. Prepare the topping by melting butter in a pan and add brown sugar. As the sugar melts and foams, cook on medium flame for a mt and pour into the baking pan. Over this sugar layer, place pineapple slices and in the center of each pineapple piece place a glazed cherry. Keep aside. 3 In another bowl, cream butter and sugar. Use a hand blender to make a smooth creamy mixture. Add the beaten egg and combine well. Add vanilla essence and combine. 5 Pour batter over the fruit layer. Bake in preheated oven for 45 mts or till a toothpick inserted into the cake comes out clean. Place on a wire rack to cool, slice and serve at room temperature. Lovely cake! I am sure Nehal & his friends loved! Sailaja, I am sure Nehal and his friends must have thoroughly enjoyed the cake. It looks very delicious. Have been following your recipes for a long time. Tried and tasted many of them and turned out really well. Thanks a lot for such wonderful recipes. 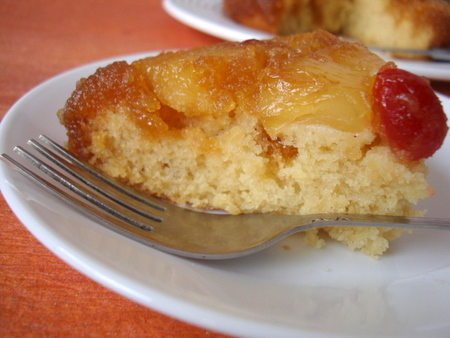 Pineapple upside down cake is a fav of mine. Will try for sure and update you. Many thanks once again. This is one of my favorites, looks delicious! Cake looks fantastic!! 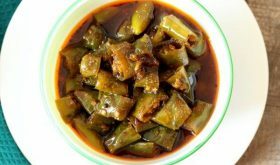 Thanks for nice Recipe and will try it soon..
How do I cook this recipe in Microwave? My daughter would love to eat this. Is this baked in OTG? This looks very colourful. I have one request, whenever you are posting a cake recipe with egg, if you can mention instead of egg what can be replaced (like baking soda, baking powder) and how much, it would be useful for people like us who want to bake it eggless. Thanks so much for the wonderful recipe. Just made it yesterday for a potluck what a co incidence……..will be posting it soon(my version 2). Upside down cakes always make me go week in the knees and yours is no exception. Love the pic. The cake sure looks yummy. What size cake pan do you suggest for the ingredient measurement and ratio in your recipe? you wont believe it, I just drafted the Upside Down Pineapple cake Recipe that I made over the weekend, and as I was looking at my overflowing reader, I was overjoyed to see you had posted it too!!! Looks yumm and mine came out looking great too!!! plz suggest me what can i use instead eggs…can i use your basic cake recipe…that curd instead of eggs? 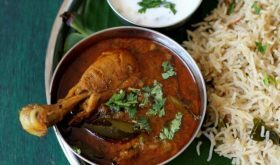 I am a regular visitor to your blog, have made many of your dishes. While googling for a marie biscuit – chocolate roll recipe I found yours, and a few lines below this.. It seems that the whole content of your recipe was copied and pasted in this website. I am unable to make out whether you contributed or it was just copied. Just wanted you to let you know. 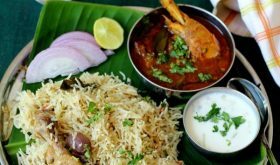 I was suspicious since when I hit the ” Home” button, I saw another blogger’s post copied as well.. Priyas easy and tasty recipes I think, not sure. Thanks for taking the time to inform me, Valli. 🙂 They have not taken my permission. Unfortunate. Wrote to them and hoping they will remove the copied content. Thanks for this recipe. Today i tried this. In the first step, while i was trying to melt the butter and brown sugar, somehow my sugar was not melting much. Once i tried to melt it completly, in the process burnt it. Second time, i did not want it to be burnt, so i took it off the heat as soon as the foam was formed ( even then the sugar did not melt fully ). And i poured it into the baking cake pan. Can you tell me what went wrong there? what else i should be doing for the sugar to melt completely? (I apprx had this butter and sugar mixture on stove for about 6-7 minutes on medium). Pretty, its matter of experience to get it right. Even I mess up and do not always get it right. Its alright even if the sugar did not melt completely. You can pour it into the baking pan once the foam starts to form in case you think it might get burnt if allowed to cook further. 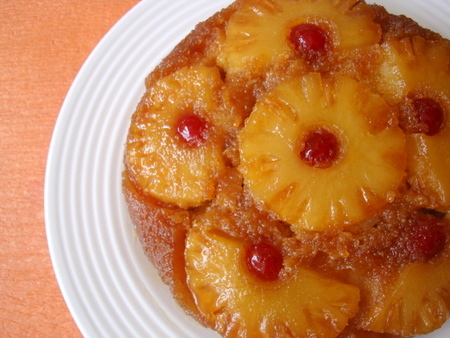 I have tried Pineapple Upside Down cake before-a recipe I got from a book. Instead of melting the sugar you can pour the melted butter in the bottom of the pan and put in the brown sugar in the bottom of the pan(kinda like sprinkling it all over the bottom) then add the pineapple slices and cherries. I hope this tip helps. I use to bake in US but in India this is the first time i am baking. I have tired many recipes and it came out very well. Now i want to try again in India too, can you tell me which butter do you use? how do you measure? Thank you. How much condensed milk should I use as a substitute for egg? Is 200 gm enough for this cake? Also is it okay to skip white sugar if I am using sweetened condensed milk. For this particular recipe, use 200 gms condensed milk, omit sugar, add 1/2 tsp baking soda and instead of milk use aerated soda. 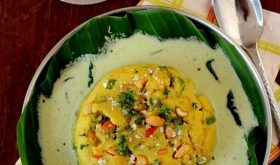 Hi sailu garu, I’ve tried this and it came out really well with no egg and substitution of condensed milk, I’m very happy as my kid enjoyed this a lot and he never used to eat cake before but for this, he enjoyed eating. Thank you so much..
hi, for how long we need to pre heat the oven? Sailu, can we use oil instead of butter? Also can we do w/o egg and milk? Sailu, please give the dimensions of the baking pan for all the baking recipes. Thanks!! I use Morphy Richards oven just like you.I place the baking tin in the middle rack but still my cakes are getting burnt below.Please advise. Is the oven in bake mode while baking. Next time you bake, see that the top rod is on while the bottom rods are off. But there is no such ‘Bake mode’option in my 24lts Murphy Richards model. Place the cake on the top rack. After the cake browns on top, remove the cake pan and cover with aluminum foil and place it back in the oven to bake till the mentioned baking time. Thank you for the prompt replies.Will surely try.